Willie Mullins bagged a four-timer at Fairyhouse and in the process threw punters a potential curveball as he suggested On His Own could have improved enough to swerve the Crabbie's Grand National and go to Punchestown after landing the At The Races Bobbyjo Chase. The 10-year-old, a faller in the last two runnings of the Aintree showpiece, was sent off the 11-8 favourite after winning the Thyestes Chase and led just about all the way in the Grade Two contest. Mount Benbulben, who was conceding 7lb, made a brave attempt to throw down a serious challenge but was never jumping particularly well and the Ruby Walsh-ridden On His Own stamped his authority between the final two fences before scoring by 12 lengths. Mullins said of the Graham Wylie-owned winner: "He's a natural jumper. Coming off a hard race in the Thyestes I thought that was a magnificent performance. "After that we might have to rethink about Aintree. I was quite keen after the Thyestes but now we might look at the Bibby Gold Cup at Punchestown. We'll have a chat with Mr Wylie. "I think he's after taking a jump in grade after that. I was thinking that in the stands and funnily enough that was the first thing Ruby said to me when he came back in. He's just going out of handicaps and could win a really good race." 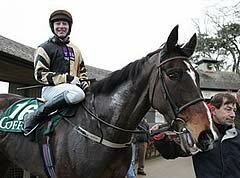 First run in 2003 the Bobbyjio Chase was named after the legendary Bobbyjo who won the Grand National in 1999. He was injured on the racecourse and died at a young age but his memory lives on with this race.